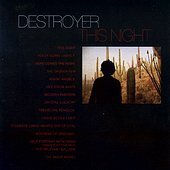 Slightly spacey, airy, and rocking, Destroyer's brand of indie rock is meticulous, each guitar part in its place, the vocals mixed to the levels the band wants them at, and the percussion, drums, and bass the backdrop for compelling songs that grab you with little attempts other than solid songs. This Night, their latest, and first for Merge, combines the best elements of indie rock, with a variety of instrumentation complimenting the standard drum, bass, and guitars format. Hear as the guitars create the sketch on the musical canvas, the vocals painting the pictures, and the drums and bass filling in the other components to ensure the picture looks crisp and clear, but has a distinct artsy feel to it. I'll give this a B+.